"Anois teacht an earraigh, beidh an lá dul chun síneadh..."
Spring is here and we are at an advanced stage planning for our annual St. Patrick's Day Parade. This year we are working with our partners Gnó Mhaigh Eo in order to enhance our use of the cúpla focal throughout the festivities. Is bliain iontach tábhachtach í an bhliain seo agus muid ag ceiliúradh Éirí Amach na Cásca 1916. 2016 is a special year for us as we commemorate the 1916 Rising, and in doing so we have chosen an apt theme for this year's parade; "Éire: 1916 - 2016". 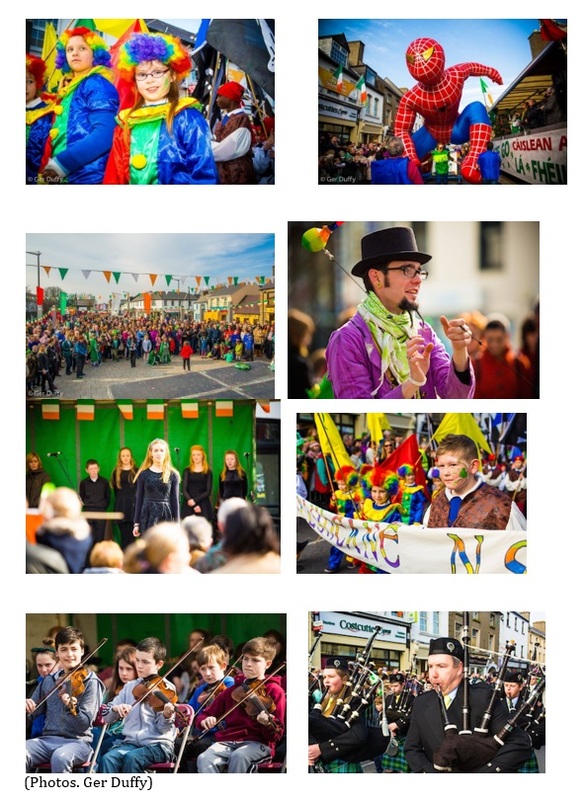 Is léir go bhfuil ‘Féile an Chaisleáin' ag dul ó neart go neart, and after the success of last year, we will continue with the same format and host pre and post-parade activities in Market Square. These activities proved to be a great hit with families as they could enjoy the events in a relaxed, safe, fun area. Chuir na himeachtaí seo go mór le spiorad an lae agus bhí an-spórt agus spraoi ann! Once again this year there will be ceol, damhsa, fun, face-painters, bouncy castles, magician, street performers agus go leor eile! The same mardi-gras feel will be foremost again this year focusing on colour, energy and participation. Ní neart go cur le chéile. Anyone interested in entering a float, band, marching group should contact the organizers as soon as possible in order to register your interest and to guarantee your slot. Any schools that may not have a band but would like to march in the parade can do so too. Beidh fáilte roimh chuile dhuine! The organisers have costumes available that they will give to schools and they can then march with a school banner at the front. As costumes are limited, interested schools should make contact immediately. Déan teagmháil linn anois!